13 ancient heritage sites ruined by vandals - The Telegraph. 20 incredible new World Heritage Sites - The Telegraph. 20 Most Beautiful Museums in the World - Flavorwire. 25 amazing new World Heritage Sites for 2017 - The Telegraph. 25 Years After Gardner Museum Heist, Video Raises Questions - The New York Times. 42 incredible museums to visit in your lifetime - The Telegraph. 123 World Museums & Galleries List - the ultimate source of authentic and reliable information about the Museums and Galleries on the net. 2016 World Monuments Watch - features 50 sites in 36 countries that are at risk from the forces of nature and the impact of social, political, and economic change. 4,500-Year-Old Ramp Contraption May Have Been Used to Build Egypt's Great Pyramid - "Archaeologists have long wondered exactly how the ancient Egyptians constructed the world's biggest pyramid, the Great Pyramid. Now, they may have discovered the system used to haul massive stone blocks into place some 4,500 years ago." An App That Will Forever Change How You Enjoy Museums - Wired. An Everyman Museum to Celebrate American Writers - The New York Times. art & artefacts destroyed by the world’s greatest museums - "A sitar that once belonged to George Harrison was broken at the V&A - and this was far from the first time a gallery has had to make an awkward apology." ART PROJECT - explore museums from around the world, discover and view hundreds of artworks at incredible zoom levels, and even create and share your own collection of masterpieces. Powered by Google. Babylon – how war almost erased ‘mankind’s greatest heritage site’ - The Guardian. Discovering King Tutankhamun's tomb - BBC. Egypt's Great Pyramid: The New Evidence - Daily Mail. 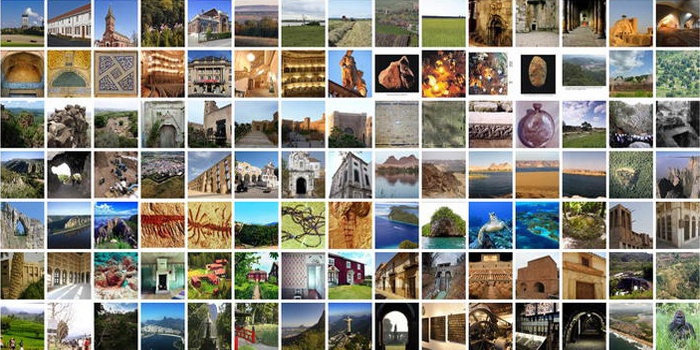 EVERY WORLD HERITAGE SITE IN ONE HOLIDAY - 962 UNESCO WORLD HERITAGE sites - VeryFirstTo.com. Farnese collection - the classical sculptures in the Farnese Collection, one aspect of this large art collection, are one of the first collections of artistic items from Greco-Roman Antiquity. It includes some of the most influential classical works, including the sculptures that were part of the Farnese Marbles, their collection of statuary. The works are now displayed in the Naples National Archaeological Museum in Naples and the British Museum in London. GLAM - acronym for "galleries, libraries, archives, and museums". Google’s New App Brings Hundreds of Museums to Your Phone - Wired. Historical Hitler Sites - "This website gives information about the exact locations of historical Hitler sites. The places Adolf Hitler grew up, the houses he lived in, the trips he made and the halls he spoke in: most of them can be found back on the Hitler Pages." Hong Kong's richest man opens $380M Buddhist museum - "Hong Kong's richest man is opening a multi-million-dollar Buddhist art museum at a monastery in the territory." Hundreds of Roman gold coins found in basement of old theater - CNN style. International Committee of the Blue Shield | ICBS - founded in 1996 "to work to protect the world's cultural heritage threatened by wars and natural disasters". It has been described as the "Cultural Red Cross", and its name derives from the usage of the blue shield as specified in the 1954 Hague Convention on Protection of Cultural Property in Armed Conflict. LIST OF LANDMARKS - a comprehensive list of major landmarks around the world. LIST OF MAGIC MUSEUMS - Wikipedia. LISTS OF THE WORLDS MUSEUMS BY COUNTRY - Wikipedia. Mapped: All the world's 1,031 World Heritage Sites - The Telegraph. METRO MUSEUMS - an international list of metro / subway, railway and tram museums. mummies' secrets uncovered in Egypt - The Guardian. New discovery throws light on mystery of pyramids' construction - "Egyptologists stumble across ramp that helps explain how huge blocks of stones were hauled into place." New Palmyra - "Join us in making #NEWPALMYRA reality!" New sphinx uncovered in Egypt - CNN travel. Not Your Average Autograph Collection - The New York Times. Seeing a Cash Cow in Museums’ Precious Art - The New York Times. Stonehenge: DNA reveals origin of builders - "The ancestors of the people who built Stonehenge travelled west across the Mediterranean before reaching Britain, a study has shown." Table of World Heritage Sites by country - Wikipedia. The American who bought London Bridge - "The bridge that crossed an ocean." The Brazil Museum Fire: What Was Lost - "Some items in the collection are irreplaceable to science, as well as the country’s national memory." The Cultivist’s Top 12 International Hidden Art Gems - The New York Times. The ‘New Seven Wonders of the World’ - The New York Times. This 4,500-Year-Old Ramp Contraption May Have Been Used to Build Egypt's Great Pyramid - "Archaeologists have long wondered exactly how the ancient Egyptians constructed the world's biggest pyramid, the Great Pyramid. Now, they may have discovered the system used to haul massive stone blocks into place some 4,500 years ago." Tutankhamun's tomb: Evidence grows for hidden chamber - BBC News. Why India has been ordered to save the Taj Mahal - Lonely Planet. Wonders of the World - Wikipedia. world’s 50 best museums - The Times. world's greatest monuments - the wrong way round - The Telegraph. world's largest churches - The Telegraph.